With a nice Sauternes perhaps? “Meals Ready-to-Eat (MREs) are a ubiquitous part of military life, particularly during training. 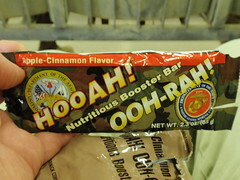 Containing on average a mere 1,250 calories each, these packages of delight are used by the US armed forces at home and abroad, and have been distributed to civilians as part of disaster relief efforts. Likewise, the civilian populace sometimes purchases them for use in outdoor recreation or emergencies for the same reason they are so popular with the military—the MREs have a shelf life measured in years without the need for refrigeration. Just add potable water and voilà—a meal fit for deposed royalty! I couldn’t resist posting his suggestion for an unusual, but spot on, combination, pairing spaghetti and meat sauce with a beloved Sonoma white. Even if you’re not unlucky enough to be dining on an MRE, I love this idea for any spaghetti and meat sauce meal. I love John’s blog even more! He’s promising MRE’s paired with savory cocktails for the new year, so stay tuned! And please, remember our armed forces this season. Even if you don’t have a loved one in the service, you can still send along holiday cheer. Anysoldier.com is a great site where you can adopt a soldier, airman, marine, sailor, coast guard member, or even an entire unit and send much appreciated care packages from home. Unfortunately, no Ramey Chardonnay. The Sonomaist is a Los Angeles based wine, food and travel enthusiast who supports her NorCal debauchery with SoCal television writing. Her co-conspirators are a stalwart husband and a Hungarian Vizsla well-versed in nefarious plans involving cheese.